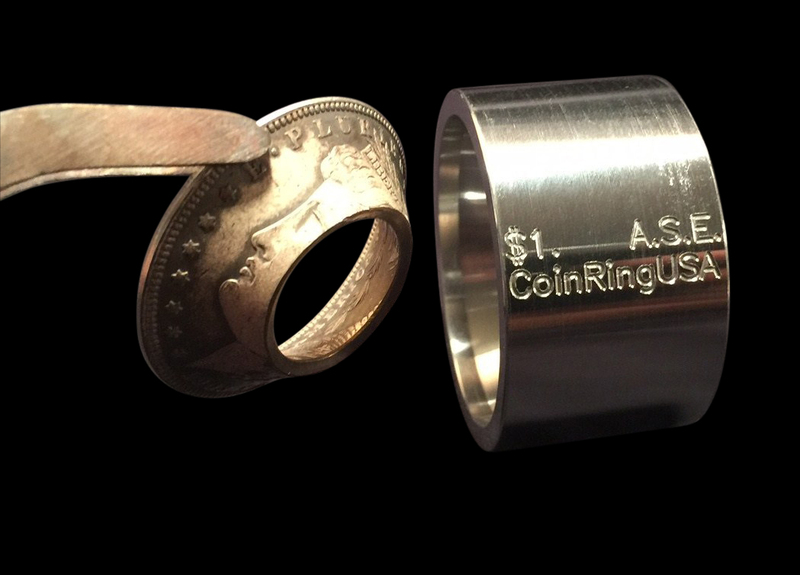 Below are several methods that were used in the past to begin the process of folding a coin over for the purpose of making it into a coin ring. 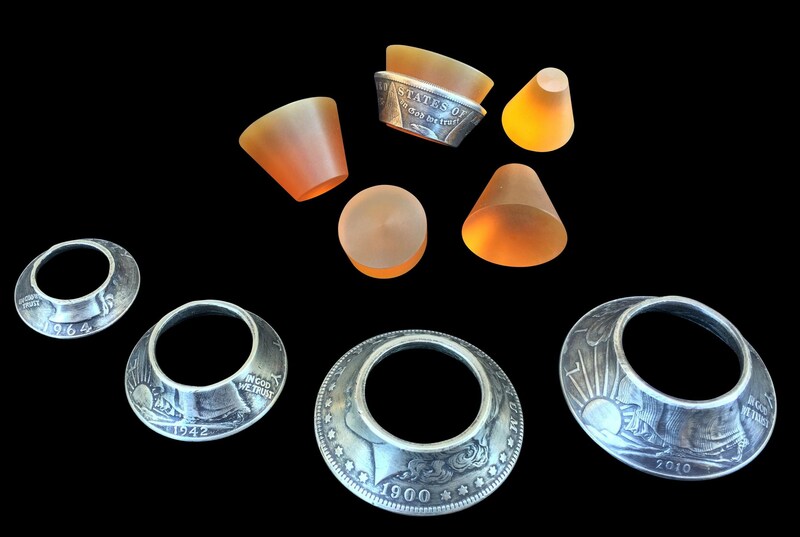 The practice of crafting a ring from a coin has been around for quite some time. It was during World War II where our servicemen would commonly take a quarter or even a fifty cent piece and over the course of several hours; tap the rim of the coin with a spoon while rotating it around. They kept tapping until the reeded edge of the coin would begin to mushroom out and curve over onto itself. They would continue this process until the rounded edge they were tapping on got to the desired width that they were looking for. This next method of coin ring making involves punching a hole into the center of a coin, and using a jewelers’ mandrel along with a nylon hammer; hitting the coin and rotating the mandrel in a circular direction until you have folded the coin over onto itself enough so that it has taken on more of the shape of a coin ring. Next, you would anneal it (heating the coin and then quenching it in water to keep the metal soft), and after flipping the coin over onto the jewelers’ mandrel; you would hit the opposite edge of the coin that was still flared out so that what you ended up with was a coin ring with a somewhat straight outer edge. This method is very time-consuming and the inner detail of the coin often becomes marred and scratched, due to the metal-on-metal contact that occurs between the coin and the mandrel. Yet another method came along that involves using a jewelers’ mandrel, but instead of using a nylon hammer to hammer and expand the coin down the mandrel, a piece of hardwood is used such as maple, oak, or walnut. 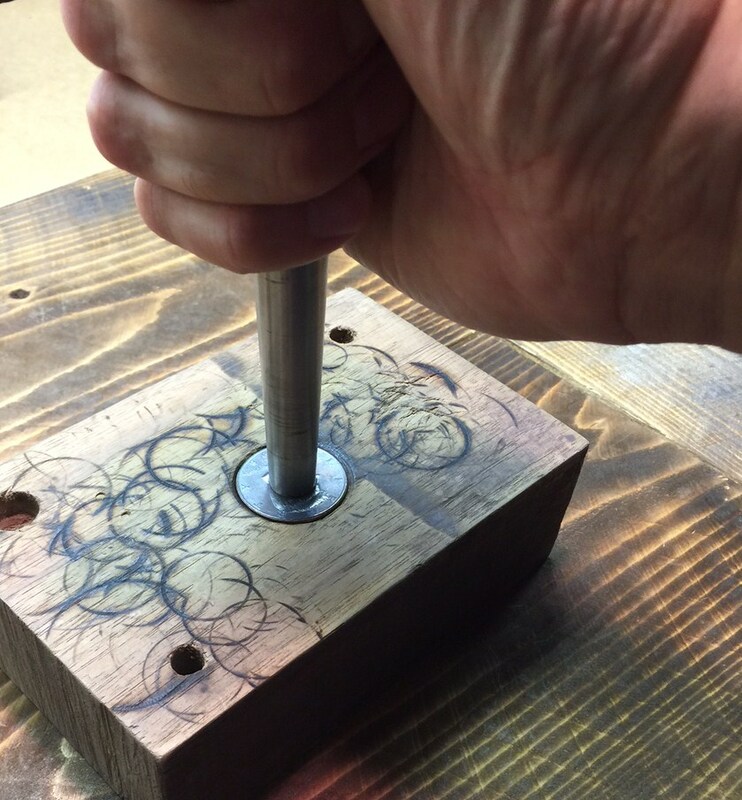 With a drilled hole into the piece of hardwood (being slightly smaller in diameter than the actual coin) along with a rubber dead-blow hammer; you would then begin to fold the coin over by driving the mandrel down through the piece of hardwood. This method saved a considerable amount of time over having to hammer the coin down the mandrel with a nylon hammer, but you often ended up with a lop-sided coin if you didn’t keep the mandrel straight. Another disadvantage was that scratching and damage to the inner detail of the coin always occured because of the metal-on-metal contact with the sides of the mandrel and the inner portion of the coin. While the plastic ball bearing method was more effective at folding a coin over than using a mandrel and a nylon hammer, there were still issues with the balls such as being left with deep impressions from the coins due to their material makeup; and the coin(s) often slipping in the reduction dies due to the round shape of the plastic ball bearings, causing a lop-sided coin. A folded-over Morgan Silver Dollar and various other coins folded over using these new and improved folding tools. 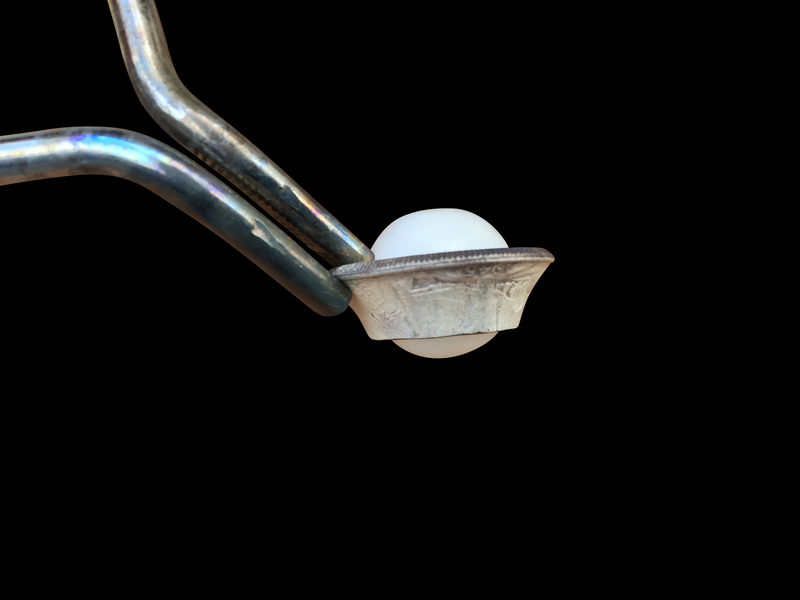 These new and improved Universal Stabilizer Folding Cones are a more effective and efficient option than using the delrin bearing balls. Their design allows them to do a much better job of keeping the coin level as it’s being folded over into the reduction dies when using either a Ring Sizer Machine, an Arbor Press, or a Hydraulic Press. To use, you simply set the coin level into your reduction die, insert an appropriate size folding cone into the beveled center punched hole, and then begin to press the coin down into the die. There are 4 different sized Folding Cones and 1 Spacer included in the Set. It’s not necessary to memorize which particular size folding cone fits into which size center hole in whichever coin you are about to begin folding over. Instead, you want to pick the folding cone that fits into your coin’s center hole, that will also fit under the ram head on your Ring Sizing Machine, arbor press, or hydraulic press. As you continue to fold your coin down into the reduction die, you simply switch to a SMALLER diameter-sized reduction die and a LARGER-sized cone (and the spacer provided if needed) to finish the coin’s folding-over process. All of the folding cones are machined from a very tough and wear-resistant material. It’s stronger than the delrin bearing balls and the folding cones made out of phenolic material, yet it’s softer than most metals, and the material allows your coin to slide easier as you fold your coins. 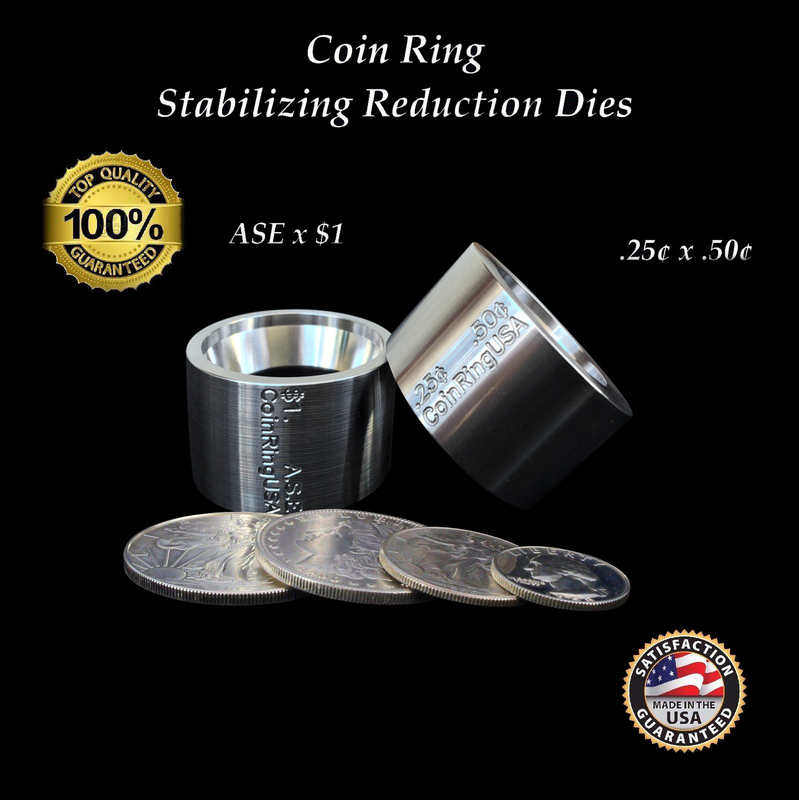 Using specialized tools such as the improved Universal Folding Cones and the various Reduction Dies that are available at www.CoinRingUSA.com, you can create a double-sided coin ring that allows you to keep 100% of the outer AND the inner detail intact, with NO scratching or damage to the coin. 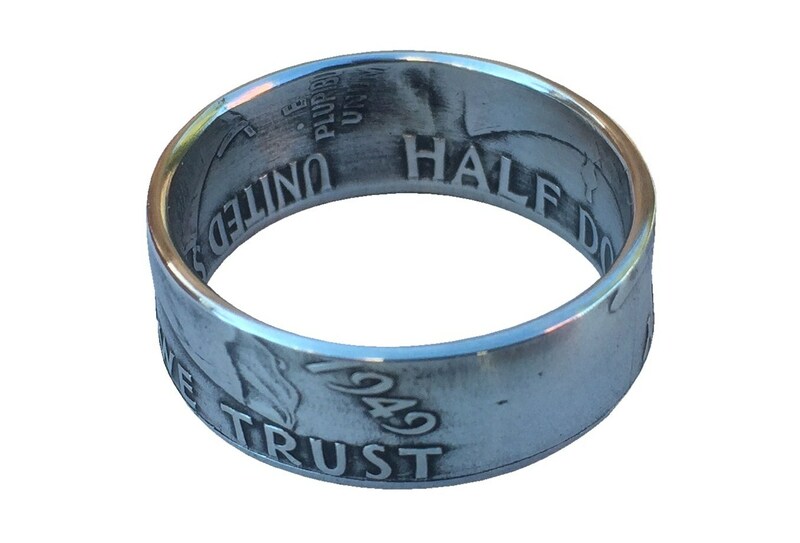 Today’s double-sided coin rings are truly unique pieces of wearable art! Feel free to reach out to me through the “CONTACT” tab if you have any questions about coin ring-making or coin ring tools, thanks!